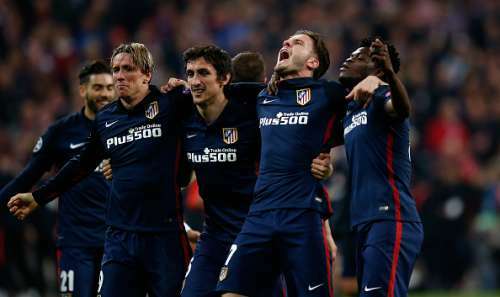 Saul Niguez’s brilliant first-leg goal came back to haunt Bayern Munich as the Bavarians won 2-1 against Atletico Madrid on the night but lost to Diego Simeone’s side on away goals at the Allianz Arena in Munich. Bayern Munich went into the match looking to overturn a one-goal deficit, with manager Pep Guardiola facing immense pressure from both fans as well as the media over his team selection and tactics in the first leg. Guardiola’s men dominated possession and dictated the tempo of the game from the very first minute as Atletico Madrid sat back and defended well, looking to break on the counterattack. The hosts drew first blood as Xabi Alonso slotted in a free-kick from the edge of the box past keeper Jan Oblak. The game took an extremely dramatic turn as penalties were awarded on both sides, with the strikers failing to capitalise. Thomas Muller’s strike was saved by a diving Jan Oblak in the first half while Fernando Torres struck an identical shot late in the second half which was parried away by Manuel Neuer. Antoine Griezmann got the ever so important away goal for the visitors, twenty minutes before Robert Lewandowski pulled back an equaliser with a header. However, the away goal proved vital in the end as the Rojiblancos booked their place in the UEFA Champions League final for the second time in three years. Jan Oblak was arguably the top performer of the match as the Slovenian international showed great reflexes, alertness, presence of mind and nerves of steel to steer his side to the final. Oblak was busy throughout the ninety minutes. The keeper was called on to save Vidal’s effort from distance right in the 19th minute. There wasn’t much that Oblak could do when Alonso opened the scoring as the ball took a wicked deflection off centre-back Jose Gimenez’s leg. Three minutes later, Gimenez conceded a penalty as he brought down Javi Martinez in the box. The keeper rescued Atleti once again as he went the right way to block Thomas Muller’s shot. Oblak also denied Xabi Alonso on the rebound. The keeper kept the Bavarians at bay for most parts of the game with a string of crucial saves, proving instrumental in Atletico’s victory.